An online software tool for creating and editing building maps such that they can be easily made accessible to blind travelers. 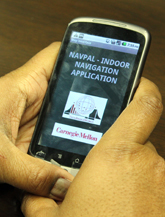 The NavPal project is being expanded to enhance safety for visually impaired travelers using public transit stations. Day-to-day activities such as using transit systems remain challenging tasks for people with visual impairments even though the use of transit systems is often a key factor for participation in employment, educational, social, and cultural opportunities. Through this work, we will be exploring the specific challenges encountered by visually impaired travelers when navigating in and around transit stations, and examine several technology options for enhancing safety for this population during their use of transit stations. NavPal is a project of the TechBridgeWorld research group in the Robotics Institute at Carnegie Mellon University and began in collaboration with the rCommerce lab.